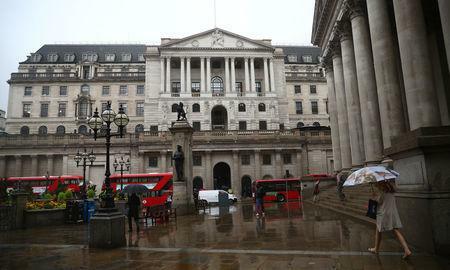 LONDON (Reuters) - Britain's central bank looks set to keep interest rates on hold on Thursday, giving the economy time to digest August's increase in borrowing costs, which was only the second such move by the Bank of England in the decade since the financial crisis. Economists polled by Reuters unanimously expect the BoE's Monetary Policy Committee (MPC) to vote 9-0 to leave interest rates at 0.75 percent. Most do not predict a further rate rise until after Britain leaves the European Union in March 2019. "The month after a decision, the data are not going to be sufficiently different to get the MPC to move the needle on their anticipated course of policy action," Nomura economist George Buckley said. Britain's economy has slowed since June 2016's Brexit vote, with consumers under pressure from a jump in inflation driven by the weaker pound and some businesses' reluctance to invest while the terms of a future EU trading relationship remain unclear. BoE Governor Mark Carney warned last week that if Britain left the EU without a trade deal, economic difficulties could squeeze British households' incomes for years more. The coming six to eight weeks are due to see intensive talks between London and Brussels to hammer out details of the divorce deal, but some of Prime Minister Theresa May's own lawmakers think she has already compromised too much. "Brexit negotiations are set to intensify," Goldman Sachs economist Adrian Paul wrote in a note to clients. "In our view, the macroeconomic implications of a disorderly Brexit mean that the MPC, for now, has little to do but wait." The BoE raised interest rates in August because it believed the economy was running close to full capacity, which risks causing inflation to continue overshooting its 2 percent target even once the effect of sterling weakness has faded. Carney -- whose term was extended this week until January 2020 to help smooth the post-Brexit transition -- said after August's rate rise that households could reasonably assume about one quarter-point rate rise a year going forward. 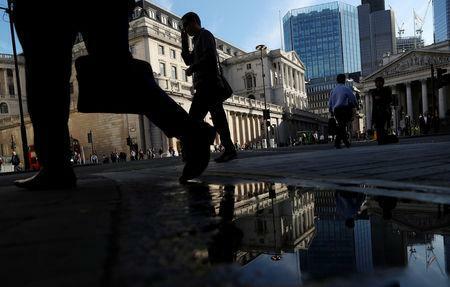 Inflation data for July came in a shade weaker than the BoE had expected, at 2.5 percent. But growth in the three months to July was faster than most economists had predicted at 0.6 percent, after the hottest summer on record encouraged Britons to spend more on barbecues and at bars and restaurants. And labour market data shows increased tightness. The jobless rate is holding at its lowest since 1975, businesses are finding it harder to hire, and wages -- excluding volatile bonuses -- are growing at a rate last exceeded three years ago.